Rural cottage, 5 Rooms, 3 Bathrooms, wifi, Pool and nature. Buena Vista Cottage and study: Comfort, peace, security, nature ... and sustainable tourism. Buena Vista Cottage has one living room with fireplace, one lounge, 4 bedrooms, 1 bathroom, 1 toilet, kitchen, shared pool and a scenic terrace that gives the name to the Cortijo Buena Vista by the spectacular scenery that can be seen. The interior is style with antique furniture. Studio is a small apartment with 1 bedroom, kitchen, living room with fireplace, 1 bathroom and a huge terrace, located on the top floor with the best views across landscape Cortijo. The Buena Vista Cottage is rented only with the Study for the same group, never for different groups. We are in the center of Alpujarras, in the Park of Sierra Nevada and adjacent to the National Park, in the valley with more biodiversity in Europe, 15 km from the Recreation Station Puerto de la Ragua , 30 km from the Highway A-92, next to the E4 GR-7 (European long distance path), ... the Cottage Buena Vista is probably the oldest and most traditional of La Alpujarra in an organic farm. Approved by the Ministry of Tourism with nº CR/GR/00024. Over 200 years looking at Laroles with Sierra Gador the background to the left Sierra Nevada, and right the Mediterranean Sea. Cortijo Buena Vista, is an old farmhouse renovated with several buildings style (flat roofs covered launa, fireplaces topped with slabs of slate, stone walls , ...) within a farm with more than 2 hectares of chestnut and fruit trees (chestnut, pear, apple, walnut, cherry, apricot, persimmon, quince and almond trees), in the Natural Park and in the most authentic part of Alpujarras and the Andalusian Legacy Trail. We offer a nice swimming-pool with filter for the summer months, where they will enjoy healthy water alpujarreñas, looking across the valley of the River Laroles dotted with old mills hydraulic. The charm of a unique landscape. All homes are differents, we try to offer an experience of returning to nature, to the home of our ancestors, but with the comforts of today and respect for the environment around us. Each house has its own space with benches and tables to sit in the sun or in the shade of a chestnut, several eucalyptus or some vines. The rural cottage La Alberca has two double bedrooms, kitchen (fridge freezer and all the basic equipment), lounge with fireplace, living room with sofa bed and bathroom. Central heating during the cool period. Cottage 4 to 5 people. Pool, to be shared between guests is just beside the house, separated by a wooden fence, ivy and a source of fresh water. You will find the living room and bedroom on the ground floor and a bedroom, lounge, kitchen including the bathroom are on the first floor. To meet the old building, access to the upper floor is a wooden staircase (see photos). The atmosphere of the house is rustic, with antique farm tools. The rural cottage Aula Nature is dedicated to the National and Natural Park of Sierra Nevada, with photographs of flowers, landscapes and maps. It is integrated into the environment, by using the surface materials such as stone, wood, "launa" (gray clay), etc.. and several vineyards that give welcome shade during the summer. A little more isolated than the other houses, is located on top of the farm, surrounded by agricultural terraces still cultivated and next to a large chestnut. It has a large bedroom, living room with fireplace and sofa bed, kitchen (fridge freezer and all the basic equipment) and shower room. Cottage for 2-3 people. My hobbies are hiking and photography. I have worked in tourism since 1977 and in rural tourism since 1989. For the tranquility. For the landscape. Because they are authentic rural houses really rehabilitated (not new construction or a block of apartments). For the excellent quality-price ratio. Because all the houses have a fireplace and heating. Because we are inside a Natural Park and next to the Sierra Nevada National Park. In TopRural since 2000. For the variety of trails and multiple activities that can be done. Because we are 1 km from the town of Laroles by road where there are supermarkets, restaurants, bakeries, ... Because access to houses is easy with parking at the foot of the road, without having to make tracks or mountain roads. Sustainable tourism in Alpujarras of Granada - Sierra Nevada Natural Park Visit in the day from the Buena Vista Cottage : we are in Sierra Nevada Natural Park; close are the most authentic Alpujarras villages and the national park that can be accessed in ten minutes; you can touch the snow and take a swim at the beach, on the same day; visit Granada and the Alhambra with its beautiful gardens; the singular Barrio de las Cuevas de Guadix and La Calahorra castle; attend a gunmen show in Miniholywood or see how our ancestors lived. We are in the center of Alpujarras, in the Park of Sierra Nevada and adjacent to the National Park, in the valley with more biodiversity in Europe, 15 km from the Recreation Station Puerto de la Ragua , 30 km from the Highway A-92, next to the E4 GR-7 (European long distance path), ... the Cottage Buena Vista is probably the oldest and most traditional of La Alpujarra in an organic farm. Approved by the Ministry of Tourism with nº CR/GR/00024. Over 200 years looking at Laroles with Sierra Gador the background to the left Sierra Nevada, and right the Mediterranean Sea. Nos ha encantado la estancia, ha estado muy tranquilo, el trato ha sido excelente e incluso nos dieron planos y mapas para realizar actividades de senderismo cerca de la casa. Repetiriamos sin duda. Observaciones: La zona de la piscina mejoraría mucho sin luz y asi por la noche podriamos estar. Pero en general muy bien. Pasamos cuatro días estupendos en El Estudio. La casa es chulísima y el entorno una maravilla. El trato muy bueno, correcto y amable. Nosotros disfrutamos un montón, y la perra aún más! Si eres una persona quisquillosa, marchosa, gamberra y amante del ruido y el desmadre POR FAVOR, NO VAYAS a este lugar, te vas a aburrir!! Pero, si amas la naturaleza, las vistas hermosas, la tranquilidad, la calidad de vida, el recogimiento y los entornos mágicos, tienes que ir al "Cortijo Buena vista". Es un lugar precioso, rústico y pintoresco. Estuvimos una semana en la Aula Naturaleza y la verdad es que se nos hizo corta. El alojamiento es senzillo pero no le falta de nada y es espacioso, con el jardin donde puedes comer debajo de la parra, la piscina, las vistas. El proprietario muy atento pero a la vez muy respectuoso. Laroles es un pueblo muy bonito, no es turistico pero no le falta de nada. Recomiendo este alojamiento para los que buscan tranquiladad y autenticidad!!! Algo para mejorar:las camas y cuchillos que corten. En plena naturaleza: casa Aula de la Naturaleza. Un lugar estupendo para escaparse por las Alpujarras más tranquilas. Los desayunos en plena naturaleza bajo el sol de primavera, no tienen precio y tampoco la tranquilidad y el canto de los pájaros. Mejorar algunos detalles como poner una barra para la ducha, renovar los colchones (aunque son aceptables) y recortar un poco la malecilla alrededor de la casa...mejorarían aún más una de por sí agradable estancia. No esperéis lujos, pero sí una relación calidad-precio maravillosa. - The country Alpujarras, is perhaps the Spanish region with the highest number of hiking trails. * You can do step three GR footpath (GR) that pass through the city of Nevada, in a morning or day, and / or combine steps. NORDIC SKIING: a ski area with 40 km. NETWORK HIKING: marked according to established standards, apart from those mentioned above, include: mounted to the "Chullo", the "Hornillo", the "Mirador de la Alpujarra", the "Mirador de Aldeire" and "Laguna Seca". MOUNTAIN BIKE TRAIL NETWORK: Mountain biking, an extensive network of forest tracks that rise from "Puerto de la Ragua" and that makes the Sierra Nevada a haven for mountain biking. The "Pilar de las Yeguas" is the starting point ROUTE 6, ROUTE 7 ROUTE 8 and ROUTE 9 to the Nevada´s BTT Centre. Mountain bike (MTB): guide service and / or rental. Service trips, luggage and picnic. BTT Nevada Center is a network of nine hikes of varying difficulty, moving mostly in Nevada City. Self-guided hikes can be done with road books and / or GPS tracks. The starting points for hiking 1-5 and visitor center is located at the entrance of the village of Mairena, 4 km from Cottage Cortijo Buena Vista. - The large number (45) and the relative proximity of the villages Alpujarrra , are almost all year round there is a party and / or verbena go. - In the town of Guadix, less than an hour from Cottage is famous Barrio de las Cuevas, inhabited cave houses in the XXI century, where you can visit an ethnographic museum. Also of interest is the cathedral and Arabic Alcazaba. More near La Calahorra (30 km from Cottage), you can visit the castle, the first Renaissance building built in the Iberian Peninsula, which hides a courtyard designed and built by the best sculptors of the Italian Renaissance. - Minihoywood West Village, where the famous "spaghetti western" were filmed: "For a Few Dollars", "The Good, the Bad and the Ugly" ... with actors like Clint Eastwood, Brigitte Bardot, Anthony Quinn, Claudia Cardinale, Alain Delon, Sean Connery, Raquel Welch Orson Welles ... Los Millares is the most important European deposits of the Copper Age archaeological site. You can also visit the megalithic interpretation Gorafe Centre with the largest concentration of dolmens in Europe. The "Cueva de las Ventanas" in Piñar is the largest visitable and accessible from the province of Granada cave. 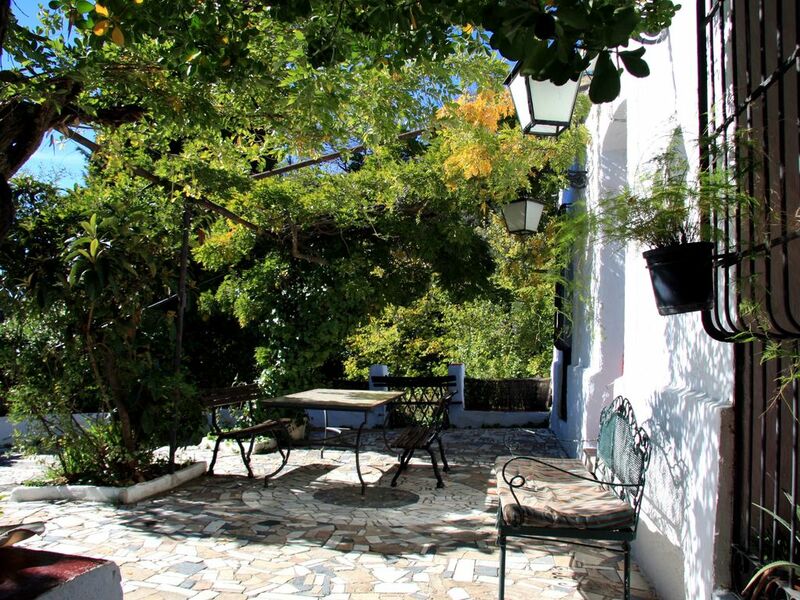 - The Alpujarras and villages: the rural area from which most writers have written centuries. Hung on a constellation of the southern slope of the Sierra Nevada, where you can visit the nearest villages, Laroles-Júbar-Mairena and Picena that make up the city of Nevada, or the path of the white population of the villages Alpujarra: Valor, Yegen, Mecina Bombarón, Bérchules then Trevélez and Poqueira Canyon . - Sierra Nevada was declared a Biosphere Reserve by UNESCO in 1986 and Natural Park. In 1999, a large part of its territory was declared a National Park for its botanical, scenic, and natural values. The flora of La Alpujarra, and by extension, Sierra Nevada, is one of the most precious of all Europe, with over 2,000 listed plants and approximately 70 unique species. - The "Puerto de la Ragua" is 15 minutes from Buena Vista, at 2000 m altitude. In this space, in addition to hosting the leisure center of Puerto Ragua, where you can practice many sporting activities, you can see spectacular scenery if you walk a bit to the "Morrón del Hornillo" or "Chullo" as well as the peaks, you will see the great plain of Marquesado, ... to the north, to the south you can see the Sierra de Gador, Contraviesa, the Mediterranean Sea and some day Africa. - The beaches of the Mediterranean: You can take a dip in Adra beach, the nearest 45 minutes from Cottage. Also nearby are Balanegra and Almerimar on the coast of Almería, Granada and La Rabita. The palaces of the Alhambra and the Generalife gardens are the most visited monument in Spain. Nearly a thousand years of Andalusian culture were reflected in its arches, courtyards and rooms reminiscent as it should be paradise. - In the town of Guadix, less than an hour from Cottage is famous Barrio de las Cuevas, inhabited cave houses in the XXI century, where you can visit an ethnographic museum. Also of interest is the cathedral and Arabic Alcazaba. Near La Calahorra (30 km from Cottage), you can visit the castle, the first Renaissance building. - You can visit so Minihoywood West Village, where the famous "spaghetti western" were filmed.